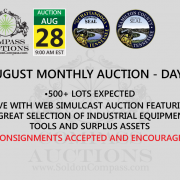 Don’t miss the chance to consign your items for this auction and have your items nationally marketed to an eager to buy audience. For additional photos, catalog of items, terms & conditions of the auction and to REGISTER to bid, visit the online catalog. 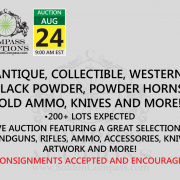 auction is currently slated to start at 9am noon EST and will feature 200+ lots of antique and collectible firearms and more!